Sanju's collections point towards a growing trend in Bollywood movies. In the past ten years or so, most of the big releases have gone on to create box office records. The first movie to make it to the Rs 300 club and change the terms of movie business was Rajkumar Hirani's PK in 2014. Now, with his next movie after PK, Hirani is set to recreate the same magic in the box office. Sanju, a biopic on actor Sanjay Dutt has already raked in Rs 284.58 crore in 13 days. 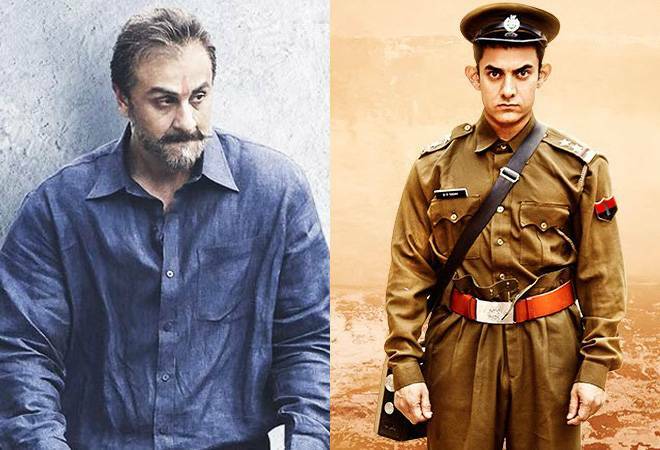 It is now set to overtake Tiger Zinda Hai, PK and Bajrangi Bhaijaan on the list of movies that made Rs 300 crore fastest - provided it reaches Rs 300 crore in the next two days. Sanju's collections point towards a growing trend in Bollywood movies. In the past ten years or so, most of the big releases have gone on to create box office records. If Rs 100 crore was the mark to strive for then, it is the norm now. Most A-lister movies sail past Rs 100 crore with ease. Even content-driven movies are earning the big bucks now and do not only settle for good reviews. But most of the movies in the Rs 300 crore club exhibit a combination of the two. Movies like PK, Dangal, Bajrangi Bhaijaan, Sultan and now Sanju do not compromise on their commerciality. Songs, dance, drama and the big names are offered with aplomb. But they also narrate a story that resonates with the masses and the critics alike, be it a father training his daughters to become wrestling bigwigs or a kind-hearted Indian man going to extreme lengths to take a Pakistani girl home. 1. Baahubali 2 (Hindi version): 10 days! That's all it took the second instalment of SS Rajamouli's magnum opus to cross the Rs 300 mark. Even though Baahubali's success paved the way for Baahubali 2's success, the latter's records remain unmatched. Baahubali 2 was released in Tamil, Telugu, Malayalam and Hindi. The Hindi version alone collected Rs 505 crore. 2. Dangal: India's highest-grossing film is also one that collected Rs 300 crore the fastest. Although it is surpassed by Baahubali 2, Dangal made Rs 300 crore in India in 13 days only. Dangal, with a worldwide collection of Rs 2,200 crore is Aamir Khan's biggest movie till date. Not only in India, Dangal is a favourite in China. Dangal's success gave a boost to Secret Superstar, starring Zaira Wasim. 3. Tiger Zinda Hai: Salman Khan's Tiger Zinda Hai made Rs 300 crore in just 16 days. The movie was a blockbuster like its prequel, but saw box office heights far beyond Ek Tha Tiger. Salman Khan and Katrina Kaif's movie went on to mint Rs 570 crore worldwide. 4. PK: What happens when blockbuster-makers Aamir Khan and Rajkumar Hirani work together? Rs 300 crore in 17 days, of course. PK is one of both Aamir Khan and Rajkumar Hirani's biggest films. The film went on to make Rs 850 crore worldwide. 5. Bajrangi Bhaijaan: Everyone's favourite Bajrangi Bhaijaan did not only make Rs 970 crore in box office worldwide, it also made Rs 300 crore in India in a record time of 20 days. Kabir Khan's movie starring Salman Khan and Kareena Kapoor won accolades all over the globe. 6. Sanju: Although the film is still running across theatres, it is expected to earn Rs 300 crore in a day or two. It is highly likely that Sanju will surpass Tiger Zinda Hai, PK and Bajrangi Bhaijaan as it looks like it will make it to the club in around 15 days. There are a host of movies that have made more than Rs 300 crore worldwide, with Padmaavat and Sultan making that amount in India alone. Padmaavat took 50 days, while Sultan took 35 days to reach that milestone in India.